Migration is one of the most significant social forces shaping the world, and The United Methodist Church seeks to be in ministry with migrants around the world. To highlight these efforts, the UMC is calling on its congregations and members around the world to celebration December 3, 2017, as Global Migration Sunday. United Methodists are asked to be in prayer for migrants and to contribute to a special offering which will be used for ministries with migrants. This is the sixth in a series of posts on unity in the United Methodist Church. This series of blog posts originally appeared on David W. Scott’s personal blog, Posts from the Frontier. The posts have been lightly edited and are being republished here. In my past several blog posts, I’ve been examining various possible sources of unity for The United Methodist Church. One assumption behind these posts so far has been that it may be possible to find something(s) that ties together all United Methodists and that unity in the denomination depends upon finding such thing(s). I’ve certainly suggested that there may be more than one thing which unites everybody (e.g., polity, worship, and mission), but the quest so far has been for something that everybody can agree upon. The idea of unity I would like to explore can be thought of not as unity through sameness, but unity through relationships and networks. This model of unity actually presupposes that there is nothing that’s going to apply to everyone, but instead looks for overlapping things that, when added together, include everyone. Here the heavy black line is the group of people who are united in a certain organization. 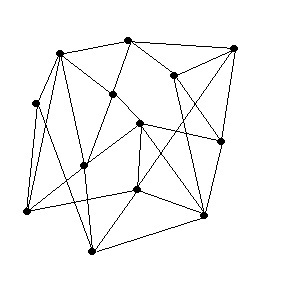 The thinner black lines are groups of people who share certain characteristics. None of these circles coincide with the heavy black circle. None cover the entirety of that circle. All of the thin circles overlap with some other circle(s), but there are pairs of circles which don’t overlap with each other. Nevertheless, by adding all of the thin circles together, all of the area inside the heavy circle is covered. Note, though, that the thin circles include not just area in the heavy black circle, but area outside of it as well. I think this is a truer-to-life model of how unity works. There is some functional way in which the heavy black circle is drawn (polity, perhaps), but most of the uniting factors that hold us together are like the thin circles – they’re things we have in common with a subset of the group as a whole as well as some others outside of the group. There’s nothing that we have in common with the group as a whole (except the polity which defines the heavy black circle). Only by adding up a series of uniting factors are we able to include the group as a whole. Yet the unity we as the group experiences comes not from the boundaries of the heavy black circle, but from the series of relationships that connect the thin circles. We are united by a network of relationships built upon a series of shared characteristics. Thus, this model depends crucially upon relationships and networks, and it’s to that aspect of the model I will turn next week. The African College of United Methodist Bishops, meeting at Africa University Sept. 3-9, has asked Africa University to reconsider a 2016 restructure that merged the Faculty of Theology with Faculties in education, humanities, and the social sciences to create a new College of Humanities. The faculties of theology and education were two of the three founding faculties, or schools, within the university, along with agriculture. This request by the bishops continues a controversy about this restructuring plan and what it says about the status and role of theology at Africa University (AU), The United Methodist Church's premier church-affiliated school in Africa. The reorganization has been criticized since it was announced. Graduates of the program, faculty, and students have expressed concern that the reorganization de-emphasizes theology, which they see as a critically important subject area for a church-related institution. The reorganization has coincided with a drop in theology enrollment and a significant decline in the number of theology faculty at AU. Africa University was created by action of General Conference in 1992. Thus, it recently celebrated its 25th anniversary with a celebration that drew United Methodists from around the world. The university was conceived to help education United Methodists (and others) throughout the continent, and United Methodists have indeed been a key part of the university's student and faculty bodies. Moreover, United Methodists have been critical financial supporters throughout the university's history. AU is supported by one of seven church-wide service funds underwritten by apportionment dollars. Additional church support continues today with the Campaign for Africa University, a four-year initiative launched in 2016 to raise $50 million for the institution's endowment. Yet the church is not the university's only financial source, and non-church support has been on the rise. With that context in mind, there are at least three different ways of reading this reorganization and the resulting conflict at Africa University. First, there is the view of the bishops and the critics of the reorganization, who see it as a church-birthed and church-sponsored institution backing down on a key commitment to the church - to provide theological education. Such a perspective could even detect in this reorganization the beginning of the secularization of AU, a path many Methodist-founded colleges in the United States went down historically. Second, there is the view of the AU administration, which has presented the reorganization as a financial and logistical necessity. AU is the size of a small liberal arts college in the US. Prior to the reorganization, it had seven academic deans, one for each college, which is a top-heavy structure for that size of school. Enrollment in the theology faculty had declined; hence, according to the administration, the move was economically justified. There is, however, a third way of reading these events not put forward by either side, which is to see it as a reflection of the changing dynamics of United Methodist higher education in Africa. While there are important distinctions between baccalaureate and master's level degrees provided, the number of United Methodist schools other than AU offering theological education in Africa has grown substantially since AU was founded. General Conference has recognized this development and approved money since 2008 to support the growth of such schools. The question, though, is whether these schools' success comes at the expense of AU, or whether a growing number of United Methodists on the continent and growing demand for theological education can increase the pool of resources and students such that all can prosper. Accordingly, the fates of AU and the other schools raise important questions about contextualization, centralization, and the nature of collaboration. Whichever of these three interpretations one takes, this story line will be one to continue to watch, since it is directly tied to how both Africans and Americans see United Methodism in Africa. About a year ago, UMC Giving put out a series of video interviews with United Methodists from the central conferences about the value they have experienced in theological education. The eleven videos are about a minute long each. While the videos are part of a fundraising campaign for an endowment for the Fund for Theological Education in the Central Conferences, they are also worth viewing as glimpses into what United Methodism, pastoral training, and theological education look like around the world.